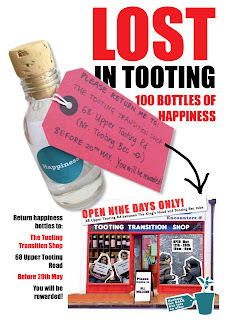 The Tooting Transition Shop was a project that ran for 10 days in May 2012. A Shop with "Nothing For Sale but Lots On Offer". This page contains Lucy Neal's diary reflections of the project. Press play below for the photographic record. “What keeps you going? what holds you back?” Our blackboard question returns full circle to the question asked on the first day. Emilio has returned from Totnes to film. He is genuinely surprised to see what has been ‘growing’ since he left. Susan, David and I hold fort out front whilst Ruth rehearses out the back. I don’t remember having lunch. At 2pm we move furniture into place for our first reading performance of Tooting Stories. The Shop visitors suddenly become an audience, even those who have just wandered in. Malik from Wandsworth Community Empowerment Network and Naseem Aboobaker from Mushkil Aassan have arrived. ‘Tell me a story about Home, about Accidents, about Love, about what it was like before’. Tooting Stories all come from everything people have been slowly adding to all week, like nectar gathered in a hive: here is the honey. Honest, ordinary, moving, sincere, magical. Brought together now into a whole. What if in everyday life we could always be so sincere with each other? so open? so honest? so affectionate? so embracing of life’s possibilities? so straight about what bothers us? so clear about what we long for? At the end, we each read out a statement of what we would like future generations to thank us for. All involved. All accountable. All connected. We pack in a talk about art and creativity at 3pm, and another reading performance at 4. It’s 5pm and we have an hour to go before the Shop closes. People are still coming in. ‘Time to reflect and anchor one’s feeling on the purpose of existence’ writes Naseem. "Imaginative and Magical. I'm glad I came' writes Malik. In mathematics there is a symbol for an imaginary number. It’s represented by “i”: the square root of minus one. The square root of a minus number can’t exist but they’re used, apparently, to solve problems with real numbers. They exist as though ‘at right angles to the real world’. For nine days we have created an imaginary, magical space for people where they can reflect on their lives, recall their pasts and imagine their futures. With ordinary things like pens, blue tak, sticks, chalk, scissors and paper they have conjured the extraordinary straight from their own lives. Emilio sets off home. It is exactly 6 o clock. We improvise: The Mayor of Wandsworth opened the Shop, Emilio with his departure will officially close it. We make an arch of honour for him to walk through and out he goes. Leon, Mal, Jeni, Susan, Esther, David, Tim, Sam, Ruth, Alice, Mal’s friend and the lady from the wonderful community website Tooting Online make swift work of a get out. Tim and David wheel the red sofa back across the A24. Richard from BAC collects chairs, the sign is taken down, the floor swept. Ruth gets her train to Devon and we go home. If you work in a shop WHEN do you ever go shopping? For 10 days I havn’t read a newspaper, gone swimming, sat down at home or restocked the larder. Its getting serious. Our house has some cat food and half a jar of pesto. At 68, Upper Tooting Road, food is arriving: we’ve programmed a Recipe Swap and Food Share from midday. Lea arrives with a vegetable curry for 40; a large saucepan strapped into a buggy. Joan arrives with Chocolate Brownies, Sabina with chickpea curry. A table fills and, casually, happily, as though we do this every day we eat and share food with people we do not know. A permaculture teacher off to lead a workshop in building houses for hedgehogs mingles with a lady writing out a memory of Tooting 30 years ago. She remembers the Hindu Temple when it sold furniture as the old RACs department store. 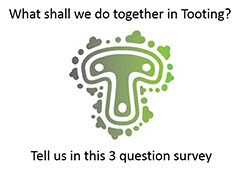 What’s The Spirit of Tooting? Determined, Working Long Hours, Diverse, Humourous, Vital, Vibrant, Modern London, Home. Hywel comes to inform me he’s nearly worked out - a year on - what the mysterious pink fleshed apple is growing in Streatham Cemetery. I’ve hidden another 6 bottles of ‘lost’ happiness. 2 return during the day. A man calls me from the market to say he has found one, and wants to know if he will be given a spell if he returns it. He seems very keen on the spell idea. The whole Shop seems a kind of spell to me. Inbetween topping up people’s happiness, refilling the glue pots and keeping track of photoing people who’ve told stories to each other, small fragments of magic are gathering on each wall and all around. It is hard to put one’s finger on exactly what the magic is. David and I attempt a discussion about this and what would be needed to re-produce the shop for longer, but with customers to attend to, the conversation stalls. David continues it at the back of the visitors book: ‘It’s such a realm of possibilities. People hover at the cusp of that possibilility....perhaps our duty is just to enable them to see what is possible to take away, what are the offers in this ‘Shop with no Products”; to open the door to the Realms of Possibility just enough." Out in the garden, Ruth rehearses with Saira, Nicky and Saira’s friend. We get ready for Hand Made in Tooting. Gillian is back with her bags and craft making. She has a collection of souvenirs from places to give us ideas of what to make as Souvenirs of Tooting: pennants, teatowels, cushion covers. Someone makes a squirrel print from a piece of foamboard, someone else sews a felt palm tree. An evening of making. I meet Ruth Ben Tovim on the pavement soon after 9am. She’s travelled up from Devon to see how her 8th Encounters Shop’s been doing during the week. She re-adjusts pictures on the wall, re-places certain objects on tables, sets things a little more ‘so’ in place and is pleased to see how The Shop has been working. The evidence is there - nearly 500 people have connected with the ‘Invitatations to Join In’, appreciating how it’s organised and the aesthetic of place, frame and question. Jon from Wandsworth Environment Forum comes through the door with some energy reporting that, tragically an elderly person has been hit and killed at Tooting Broadway less than half a mile away, hours earlier. This is not an ‘accident’ he says. An elderly person hit in a town centre with HGVs, buses and heavy traffic using roads also used by shoppers, children, families, pedestrians is not an accident. Priority and care needs to be given to everyone using the town centre, especially those who take their time to cross roads and are not in vehicles. The bee hive has experienced an astonishing assault of flower painting. It looks like a meadow-scape ready to welcome any enthusiastic colony. I counted the ambulances yesterday - there were 16. The siren sound splits the ears as it passes. We’re near two hospitals. Today I register accutely why ambulances tear up and down the High Road. We have to find 3 performers for Sunday’s performances at 2pm and 4pm. One or our Shop Hosts Nicky will do this. At 5pm Saira confirms that she can do this. At 10pm we think we’ve found a man but it turns out later that Sunday won’t work out for him so we are still hunting. Another intense day. The Shop Hosts are getting into the swing. We are getting ready for a skills swap in the evening. I have no idea how that will work but trust to providence and serendipity that it will all work out. I can’t remember who has offered what. Sign language from Saira, Cushion making from Gloria, Star Wars Lego from Sonny, Planting out seedlings from Share Community Gardens, Bag making from Sabina and I think Jeni wanted to do something with origami or was it crisp packets. All will be revealed, but here comes the owner of the Shop Mr Patel, and I am delighted he has come to see for himself what’s been going on at 68, Upper Tooting Rd. He is with his father and I guide them around the ‘Futures’ corner, ‘What do you want future generations to thankyou for’ and the bee hives’ ‘advice to strangers’. He’s smiling broadly. The Futures corner is filling up with people’s concerns and what bothers them. Everything is here from climate change, a lack of jobs to from a 9 year old, ‘falling in mud’ and ‘no one helping me’. Something true and brave about these concerns being placed in this frame together. Audrey Helps, the Town Centre Manager makes a flying visit. She takes lots of pictures, tells a story about trees and absorbs Tooting life growing in the shop. She says she likes it all. The Skills Swaps that evening hums. Everywhere we look there are people sewing, planting, exchanging, making, learning. Saira sits in the sofa teaching sign language and I learn that Tooting is two taps on the teeth. 30 people or so who have never met before. The atmosphere is quiet and purposeful. Jan Zoet, visiting from a theatre in Rotterdam marvels. Giles explains how he found an 8000 year old flint in the Community Garden. I call it the The Tooting Tool: our ancestors and their making have found their way into this evening of human making. You know something is beautiful when you realise you’ll miss it when it’s gone. Although I am completely exhausted, I know I’m getting ready to miss this life of opening up, keeping shop. As I lock up, two gentelmen stop to read the poster, ask if I wouldn’t mind pleeease letting them look in the shop quickly to have a look and see. I tell them to please come back tomorrow. I need to go home! Sunshine. Our first post!!! Sonny has posted a letter under the door for his Star Wars Lego Workshop on Thursday for the Skills Swap. I stick it up on the window and all day other children stop to read it. David arrives to host the Shop. We do the ‘Snappy Snaps’ run to Tooting Broadway to develop photographs to add to the collection of who has ‘Told A Story About’. We write out a Happiness Prescription. As they leave to walk back to school one child announces ‘I’ve left 4 bits of myself in here now’. A fifteen year old: ‘I really enjoyed myself and will be thinking about it for the rest of the day’. A local shop owner: ‘Needs more of this help in this area. Nice to see after 19 years.’ and a local resident: ‘I think this is a wonderful idea. I was able to share fond memories of earliest childhood days in Tooting. 4.47 I am still here’. Almost everyone who comes in seems more than willing to leave ‘a bit of themselves’. Much of the power of what makes this shop experience work is hidden in the careful structuring of the ‘Invitations in’, the attention to detail and aesthetic and the steady work of the shop hosts leading people through. There’s an undeniable magnetic pull that brings people across the threshold. It’s curiosity and I’m fascinated by the ability of this ‘art’ of surprising people in this way. Art opens people. Their own curiosity creates the smallest intervention in their lives. When they cross the threshold of the shop they suspend what they believe, what they know. At that moment they are open to something new. They’re shifted by crossing the threshold. For a fraction of a second, at that point, everything becomes possible for them. The Shop has parallels with a beehive. Simple in structure: frames placed lightly together. An entrance and space inside to make a home. With the bees, in time, they wedge up holes with propolis like a glue and apportion spaces for nurturing young, storing pollen and making honey. The Shop’s structure is simple too: a series of well worded ‘Invitations In’; instructions to the Shop Hosts and a space on the High Road. All the rest is done by people coming in and out - engaging, using, building, inventing and inhabiting. Fascinating. Esther arrives and we choose the question for the day. She makes the tea and I write in chalk on the Blackboard: ‘What did you last borrow from your neighbour?’ See what that elicits. The elderly gentleman who lives next door says he is just going up to the shops and will be back shortly. Everyday exchanges. It isn’t lunch time yet and I’ve counted 10 ambulances already. I hear the unlikely news that the Queen is in Tooting today. It remains cold. After 3pm there is a rush of school children. David passing by drops in. He works at the Hub, a youth centre around the corner. A few minutes later his colleague Edwin returns with several young people. Askance at the idea of involving themselves, within minutes they are telling stories on the sofa. The idea of someone visiting from the future who says ‘I hear you live in challenging times: the rich getting richer, the poor getting poorer, the earth’s resources used by humans as if they were endless’ holds their attention for a long time. Another lady who stays a while says she will return tomorrow. The Burntwood school girls are taking turns to ‘do’ the Lake of Tears. They say they will return with friends and would like to do the work of hosting visitors to the Shop. A 15 year old writes that the future is not ‘scarey just different’. A young man from China explains how different life in China is from a few years ago. Everyone wanting material goods, although the way he explains this, it is clear this is not what motivates him and there must be others who share his concern at how quickly an acquisitive and competitive nature seems to have taken hold. We have a Transition Town Meeting that evening in the Shop which feels novel. We welcome a number of visitors: amongst them from Battersea Arts Centre and from Wandsworth’s Economic Development Office. Many comments in the visitors book make reference to how much the chance to reflect on their lives is appreciated. A wet and cold day on the Upper Tooting Road. Having the Shop door open is quite challenging although it becomes quite easy to encourage people inside when they are standing under an umbrella staring in. Some people stare for quite a while looking at the poster and peering in through the windows. They appear suspended; simple curiosity has slowed them up as they puzzle what the Shop offers. The threshold they have to cross to come in really is a distinct line they must cross and our work as shop hosts is most creative at this point. It feels sometimes like tickling trout. Too much enthusiasm and we appear to be selling something; too little attention and people wander on. Sometimes a friend encourages another; sometimes a child heads straight in leaving a parent on the doorstep. One has to get the tone just right and every single person requires a slightly different approach. Several hours of this is exhausting and you realise running a shop is a kind of performance really. You’re on show. Anyone at all may come through the door. And they do!! “ Gangs; robberies; fighting’ ‘people who smash windows’ ‘what happens to my pets when I am not there’ and ‘what actually happens at the end of world?’ Fears honestly and straightforwardly expressed but so also are the things they would like to have future generations thank them for. ‘Families being lovely’ ‘For Being Me‘ ‘Making lovely books and planting trees’, The Shop seems perfectly suited to giving young children the space to give voice to what it is that concerns them and take the leap of imaginations of what they might be thanked for by future generations two hundred hence. As the children made the space their own, we had a surprise visitor from Transition Totnes, Hal Gilmore who absorbed the scene with some amazement, recording his visit on the Memory Map - now a profusion of tales told about the town: St George’s hospital is becoming quite a centre of people’s lives - births, injuries fixed and doctors thanked. The Common a place of first bike rides, first kisses and houses recorded as long term homes or remembered once as farm land. In quieter moments there are people who come in on their own, within moments, their inner worlds opened up about loss or separation. It is impossible to pinpoint how magical it is to know the space can absorb so many stories within such a short while. We feel we are at the centre of a very gently spinning universe. Some just come and sit, listen to our welcome, ask for a cup of tea and go their way, blinking a little that they found their way in. Around four there is a flurry of families and children coming home from school, some only want to take a ginger biscuit, others whittle a stick in the whittling circle and plant something they would like to grow in Tooting this spring: ‘less gangs’ ‘pineapple cake and strawberries’ ‘ a water park’ ‘more love in the family’. The Lake of Tears is less visited. The activity requires time and a desire for quiet reflection. A haven for those that choose to do it. The Blackboard Question today is ‘Who do you want to thank?’ and ‘Who or what do you miss?’. The board filled very quickly with thanks to family members on both counts ‘My grandmother’ ‘My aunt’ ‘I miss my mother every day’. One lady came and stood by the board and simply wept: the sight of others’ statements opening something in her. The Shop appears to make the space for emotions held so close to the surface to tumble out. Locking it to come home, I feel affection for The Shop. In three days it has come to life. ‘Good theatre’ said Joan Littlewood of the Theatre Workshop ‘takes the energy from a place and hands it back as joie de vivre’. Seven shops like this to date have been created by Encounters Arts in cities around the country. This is their first in London and the first commissioned by a Transition Town. Could the Shop evolve as a place of dialogue and exchange between the public and a Transition Town initiative? As public art and social project it’s an experiment - the dimensions of which are beginning to dawn on me as the birds sing. Artists Ruth Ben Tovim, Ruth Nutter and myself have had an intense three days getting the shop ready: borrowing furniture from South London’s Battersea Arts Centre, finding chairs in skips; carpets and bookshelves from neighbours and my own house. On Friday we dodged buses to wheel a red sofa across the busy Upper Tooting Road, borrowed plants from Share Community Gardens and put calls out for more lampstands. By the evening, the Shop looked beautiful - ready for an opening that would welcome the Mayor of Wandsworth, Sadiq Khan MP, guests galore and hardy walkers concluding a day-long Treasuring Tooting Wellbeing Walk around the Town. What was the idea behind the Shop? Starting empty, it would be brought to life day by day with stories of the town. A neutral public space for people to reflect on everyday life and what it is like to live now for themselves and their community? What memories do they they have? What places hold special significance and what world do they long for? Could a positive future be collectively imagined there? Could it build resilience in helping people look at the challenges of the times, in Tooting and the world. Key to the Shop’s success would be the ‘Invitations to Join in’: activities that invite people in in different ways, engaging with what’s on offer and with each other. Over nine days the Shop would map people’s lives, making visible what lies beneath the surface of everyday life and the interior worlds people carry inside them. The experiment will test whether the Shop can be maintained, once set up by the ‘Ruths’, by a local transition initiative. We would be left to mind the shop. I’ve been left with the keys in my hand and responsibility for a team of shop hosts. Between us we’ll keep the project going for the rest of the week, until Ruth Ben Tovim returns at the weekend to gather up the week’s stories to create a performance of Tooting Stories on the last day. Like an unpredicatable new kind of life form - it feels rather like being asked to steer a ship at sea with no experience or navigation skills. The day ahead would prove what was required of us. I cycle the 5 minutes to the shop from my home: there is much to do to set up Shop each day before opening the door. As I come round the corner, I see our Shop (an ex Tile and Bathroom shop) with its sign ‘Tooting Transition Shop’ (made by Jane H from bottle tops) swinging in the window. My heart lifts. I follow Transition Totnes’ Emilio Mula’s instructions to take pictures of the areas of activity everyday so we can track how they change. These will be added to as each member of the public comes in and leaves a trace: memories, stories, drawings, fears, what makes them smile, what holds them back, what advise they would offer a stranger, what would they want future generations to thank them for? Stop start frames will speed these up and show the shop changing over time to make richly layered story of Tooting. Sun streams through the windows and falls on a bright blue wheelbarrow (salvaged from the garden out the back) which entices people with the question: “What do you want to grow in Tooting this Spring?’ Buses, cars and frequent ambulances roar past by and I feel I’ve joined a a really new High Road world. Our first shop visitors walk in curious and puzzled. We greet them, nervously. A father brings a young son; a couple spending an easy going Sunday tell a story each and map where they first kissed on the Common. A lady heading home to Jamaica reads to me from the Bible and Esther tells me a moving story about faith. With each hour that passes I am in awe at the goodness, kindness, humour and humanity the shop is opening out and revealing in people. Their stories and willingness to leave some trace of their lives is so close to the surface. One inkling of permission and there in front of you; their pain, their joy, their spontaneity. One child writes that the dinosaur makes him fearful whilst a woman writes that she fears her mental illness may return, another writes mother and father in Urdu. Their is no hierarchy here. Everyone’s story has the same value and this speaks volumes for the skill in participatory arts that Encounters’ Shops have pioneered. 1.00 I take 5 minutes in the sun to eat a sandwich in the garden at the back. I pick some wild flowers growing amidst the piles of thrown out bathroom tiles to put in the shop vase. 2.00 A switch in the shop host rota and I’m joined by Hilary. We click people in and out; up to 130 across the threshold since we opened. I’m confounded by an elderly lady who speaks no English, only I discover later Punjabi. I try my best. She really wants to be in the space but I don’t have the resources. Another time we should be better prepared. Indrajit Patel the Chair of the Tooting Business Network visits. He has kindly bought us an urn and is thrilled by the space we have created in the community. It’s rare to have a space where people can simply engage, encounter each other in this way. We ask people to sign the visitors book and their surprise at finding such a place is reflected. 3.00 I get out in the air and walk down the High Road to put up more posters and hide bottles of happiness (we have hidden 100 ‘lost bottles’ of happiness which ask people to return them to the shop and be rewarded with a chance to ‘top up’ their wellbeing and happiness from gorgeously decorated wellbeing vessels prettily standing on shelves. )There are 400 family run businesses in Tooting and I stick posters in some of the windows. A Starbucks opened on the Broadway the day before and I add our posters to their spanking new ‘community board’. 5.00 I really am very tired. Two children are painting the bee hive with flowers, an elderly gentleman who tells me he comes to Tooting to shop in the Asian shops sits quietly writing his memory of Tooting to pin on the memory map. One lady stands very very thoughtfully by the Lake of Tears absorbed in the music played to her on an ipod, reflecting on what makes her grateful, what makes her sad. 6pm. Sweep the floor, wash the glue pots and sort the scissors. I turn off the lights, bring the stand in from the pavement, lock the door and cross the busy arterial ‘traffic corridor’, the A24 that careers through the town. Tooting really is a remarkable place. Resilient, busy, diverse, quirky. I feel a part of this busy life of people surviving, thriving. Up tomorrow and start again. Monday morning brings a primary school to visit and an evening talk about what we consume. I feel privileged to be a host of this extraordinary space which is drawing and reflecting back so much life. ‘Nothing on sale’ but yes, LOTS on offer. 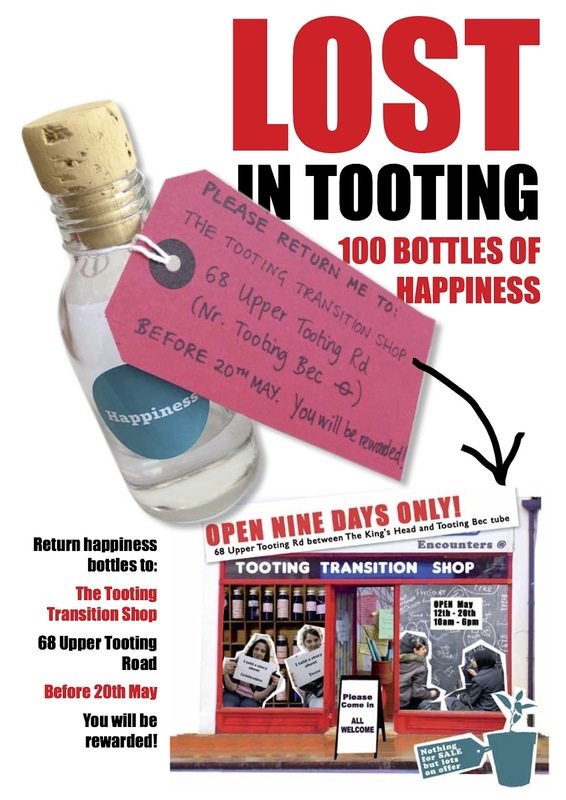 From Saturday May 12th, TTT will be running a shop in the Upper Tooting Road for 9 days only with nothing for sale but lots on offer! JELLYBRELLA, coming on May 11th. Click the photo for info. We need your help! 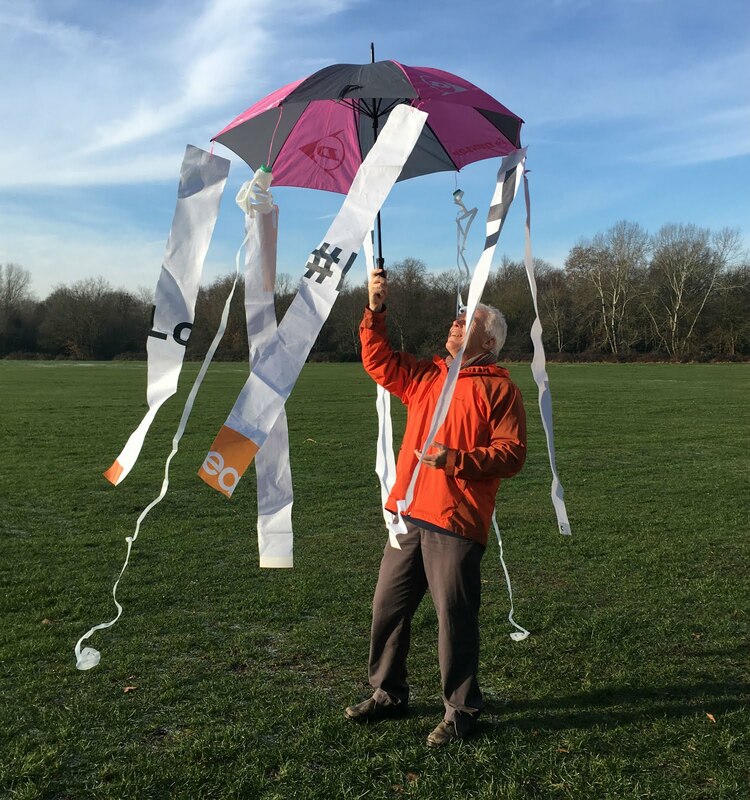 Please donate any wasted, folorn or broken Tooting umbrellas so they can be re-purposed in a Jellybrella workshop! You can donate at any TTT event, or at the Community Garden on any Sunday. CAN YOU DONATE TO TTT? 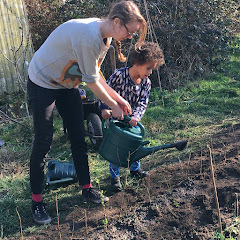 TRANSITION TOWN TOOTING IS A TRANSITION TOWN INITIATIVE EXPLORING HOW THE LOVELY, DIVERSE & UNUSUAL SOUTH-WEST LONDON COMMUNITY OF TOOTING CAN RESPOND TO THE CHALLENGES AND OPPORTUNITIES OF PEAK OIL & CLIMATE CHANGE.